This condo features several tasteful upgrades for your comfort. Laminate wood flooring throughout the unit. Clean and modern furniture. Soak up ocean views from your bedroom, kitchen and lanai. 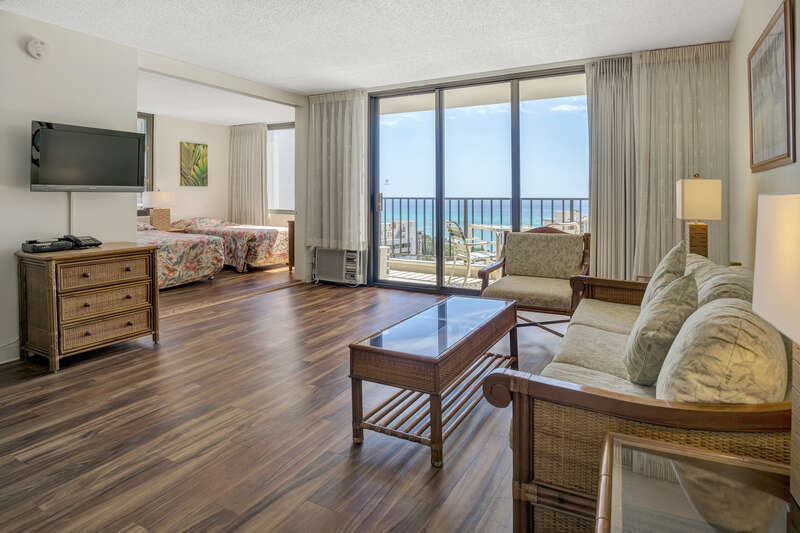 This corner condo offers the largest size suites available in the Waikiki Banyan! Plus, there are two doors to access the bathroom giving more privacy to bedroom occupants. Kitchen includes refrigerator, range, microwave, rice maker, coffee maker, and other kitchen wares. There is a kitchen table with seating for 4. Convenient sleeping arrangements include a queen-sized bed in the bedroom, and a twin-sized futon day bed in the living room. 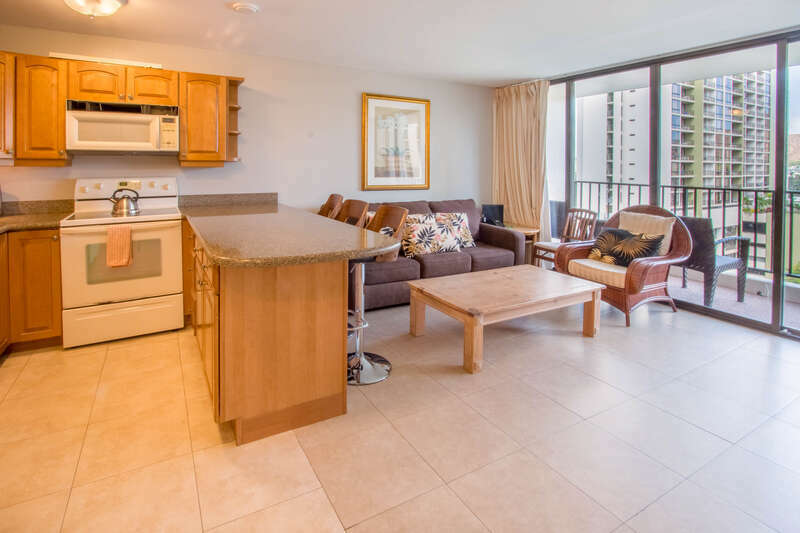 Save money and enjoy the convenience of a full kitchen, FREE covered parking, TV with cable, FREE in room WiFi, FREE local and toll free phone calling, and A/C unit in the living room. 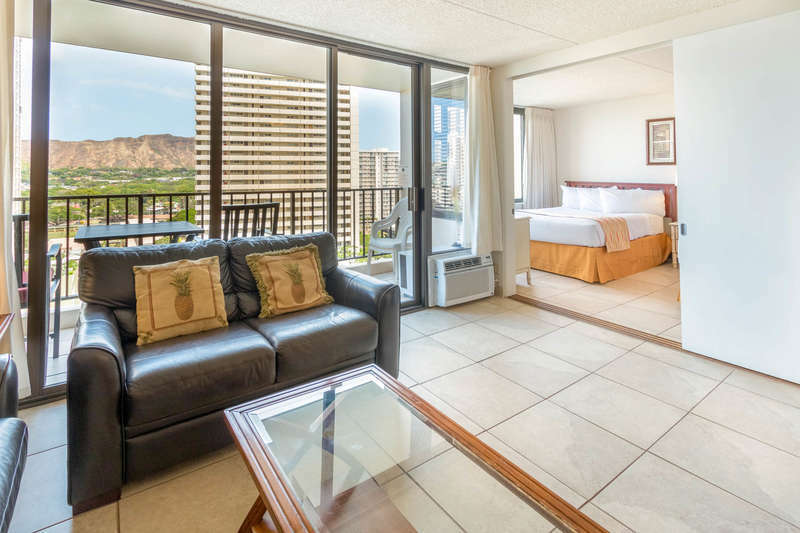 We have gone out of our way to make your stay in Waikiki spectacular so take advantage of all the extras we provide. Enjoy your slice of paradise in this bright and beautiful condo suite. Book today!